An Excelsior woman has invented a product that removes oil and grease stains in less than five minutes without water. EXCELSIOR, Minn. -- If you've ever gotten a stain on your favorite shirt, you know how frustrating it can be. 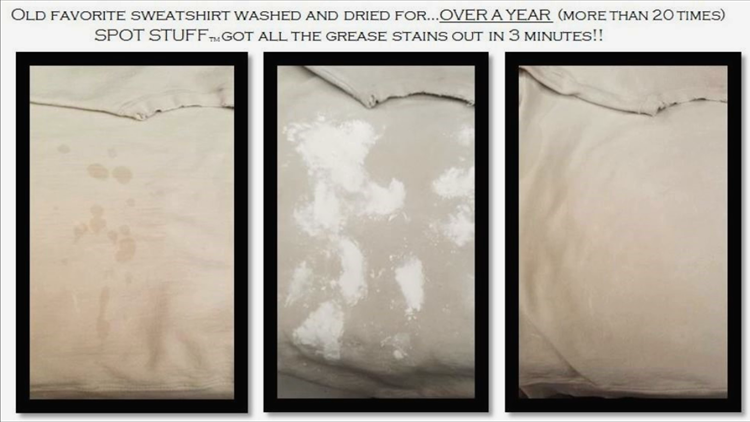 An Excelsior woman has created a dry powder that gets rid of oil, grease and fat-based stains in less than five minutes. 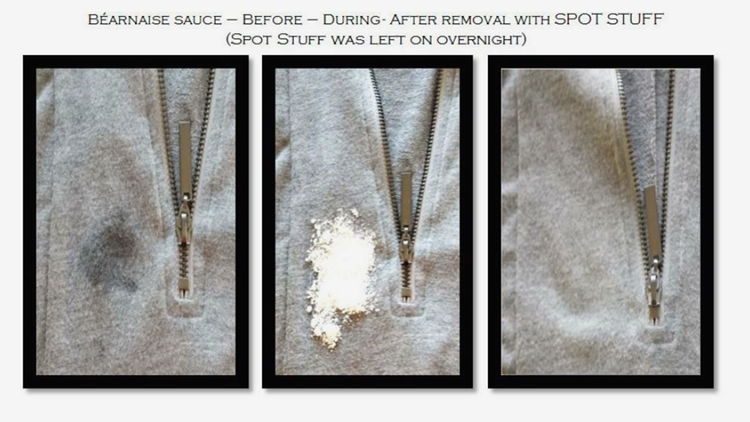 Spot Stuff removes both old and new stains without using water. "It's been really crazy," said Milissa Nelson, founder and CEO of Spot Stuff. Nelson created the product while working as a full-time technology consultant in the aviation industry. "I travel with silk and rayon a lot because it rolls up easy and I can throw it in my suitcase. But if you use a wet remover on them or you get them messy, they're ruined," Nelson said. "I've tried everything out there—all the wet products—and I thought, there's gotta be a better way." So Nelson set out to create the perfect stain remover. She would test out different concoctions on all kinds of stains (mayonnaise, olive oil, pizza grease) on different fabrics. She even bought her own 600-pound machine to package her product. Nelson came up with the name Spot Stuff because she would leave for work and "my husband and my kids would have everything put away when I got back and I'd be like, 'Okay, where's my Spot Stuff?'" Here's how Spot Stuff works. Place the powder on any old or new stain that's oil, grease or fat-based, let it sit for three to five minutes, then brush it off with your hand. The dry powder is made up of all-nature, eco-friendly ingredients made in the U.S.
"It's been really fun and to see people save things that they think they would have to throw away. There's 13 million tons a year of textiles that end up in landfills because they're ruined for some reason or another," Nelson said. It's been more than 10 years since Nelson first started her experiments. Now her products are being sold at about 4,300 Walmart stores nationwide. Spot Stuff was selected as one of the winners in Walmart's 2017 U.S. Manufacturing Open Call. "I had one of the vice presidents come up to me and hand me a card and say, 'Congratulations, you were one of the most talked about products at the entire show,'" Nelson said. The Spot Stuff laundry shaker bottle retails for $4.97 and the travel pack cost $2.97 at Walmart stores and online. Nelson has some tips for using Spot Stuff. If you can, place the powder on the backside of the fabric to help avoid damaging the fabric. Some materials, especially if they're thicker, may require more than one dose to remove the stain. The best way to remove the powder? Your hand or if you're using it on carpet, a vacuum. Nelson said right now they are working on a stain remover for red wine. Nelson added, "It just doesn't even seem real. Any mom can work on something and get it in the largest retailer in the world. It's pretty neat."